Conservationists working to save endangered plant only grown in San Diego. 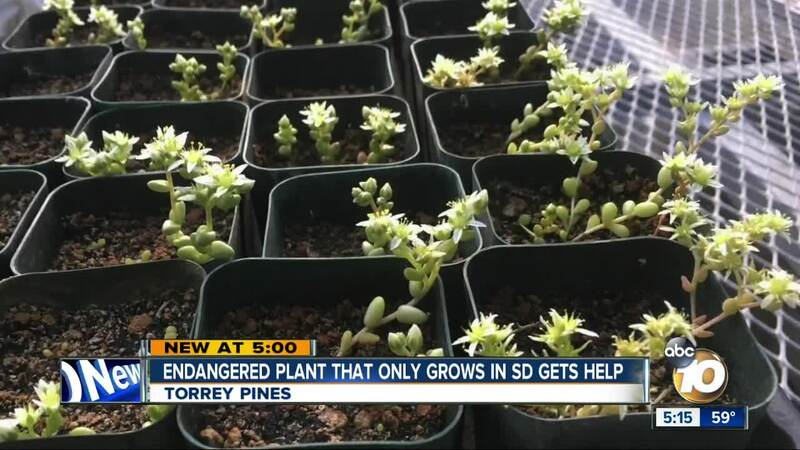 SAN DIEGO (KGTV) - Conservationists planted dozens of Short-leaved Liveforever in a secret location Friday in an effort to help the succulent survive, according to San Diego Zoo Global Plant Division and the Chaparral Conservancy. The reason for the secrecy was due to the same two reasons the plant is endangered: Illegal harvesting and vandalism. David Hogan, Director of Chaparral Conservancy, lent seeds from an area in Torrey Pines to San Diego Zoo Global, which cultivated the plants for two years. Hogan grew up in San Diego and says his earliest memories are toddling around in nature. He says he's been keeping a close eye on these tiny plants for years, and is now thankful for the handful of grants from various agencies to make reintroducing Liveforever possible. The plant gets its name from its life cycle, sprouting leaves in the summer, and dying down to its root in the winter. Just off the trail, two yellow measuring tapes sat straight as arrows, creating a grid for the Zoo Global team to note where they planted root shafts. "[They're] pretty tiny; the only way we're going to find them is from these measurements," Joyce Maschinski, Vice President of Science and Conservation with Zoo Global said. She wasn't kidding. Looking down, the tiny plant blends right into the rocks surrounding it. Only a trained eye and careful steps keep these conservationists from stepping on the precious wildlife. Hogan said the Liveforever would grow about three times its size in a good year. In the summer, they can bloom beautiful flowers. That's part of the draw for illegal harvesters who sell the plants in Asia. Conservationists used tweezers to hold the roots in just the right place as they filled the marker-sized hole and watered the plants. "Everybody knows that it's kinda hard to kill a succulent so they should be able to do well as long as we get them in there, in the right place to grow, and give them some water," Research Assistant with Zoo Global, Joe Davitt, said. Altogether they planted 46 root shafts across two locations. "They're nowhere near as appealing to a lot of people as a, say, a baby polar bear or a giraffe, but they're just as equally important. They're part of the incredible biodiversity of life on earth," Hogan said. The Liveforever only grows in five places on Earth, between La Jolla, Carmel Valley and Del Mar, Hogan said. "Sometimes it's appealing to go out onto the cliffs to get a better shot for the camera or the ocean or the sunset, but that's unfortunately where a lot of these really rare and endangered animals and plants live," Hogan said, encouraging people to stay on the trails. "A lot of us who work with conservation connect with nature as home; this is where we go for comfort, this is where we feel the most connected with the rest of the world," he said.